IDJNOW was kind enough to swing by our brand spankin’ new trade show booth at NAMM this year, where they monopolized Matt Conrad and filmed him for no fewer than three videos on our new Music Creation Suite, the StudioLive 16.4.2AI, and the also-new AudioBox Stereo. New for NAMM: Studio One Add-ons! If you’re looking to get your 808 on without shelling out $3,500 on ebay—and don’t forget that a MIDI-sync mod will run you for another couple hundred—this is the right pack for you at less than 1/100th of the price. But drum machines don’t begin and end X0X kick drums, so the exclusive Goldbaby Essentials Soundset for Impact features a whopping 500 samples from beatboxes of yore, arranged into 32 Impact drum kit presets and 124 new musicloops. 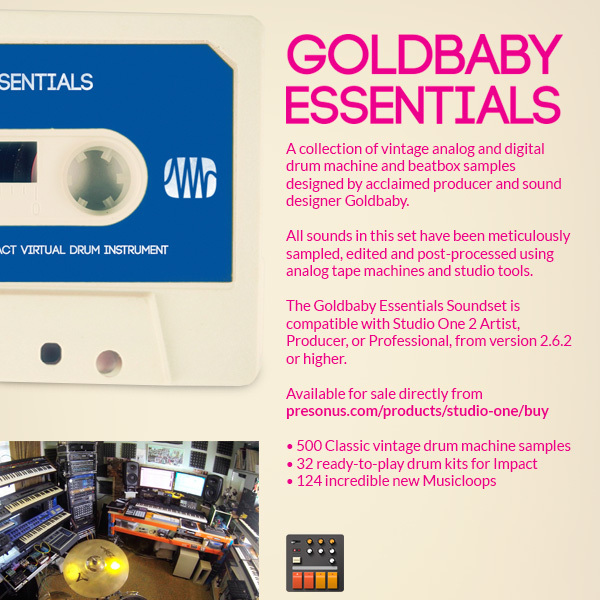 You can purchase and download Goldbaby Essentials for $29.99 by clicking here. If your sonic endeavors concern matters more grim and forstbitten, then the Ampire XT Metal Pack is your expressway to the heavy-guitar underworld. The pack features six new bröötal amp models for Ampire, as well as six new cabinet emulations. Furthermore, we’ve recognized that metal drums (and metal drummers) have rightfully begun to infringe on the guitar’s monopolization of the metal spotlight. As such, we’ve included a brand-new metal drum kit for Impact, rife with clicky kick drums, anvil snares, and, well, metallic cymbals. We decided against including drum samples inspired by St. Anger. Up the Irons! 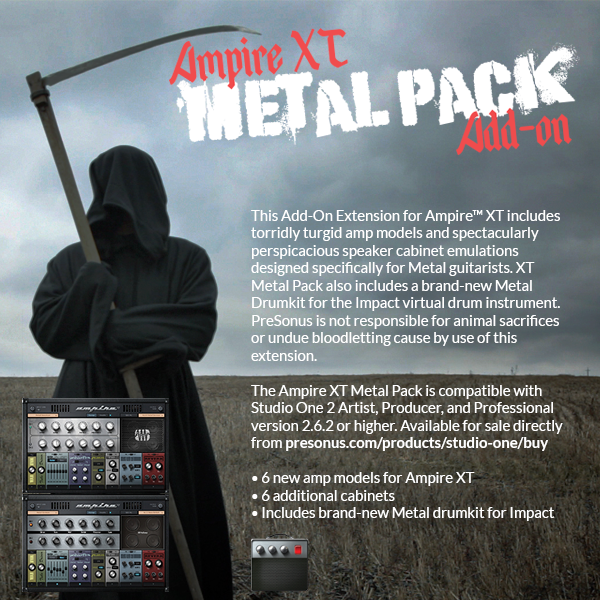 You can purchase and download the Ampire XT Metal Pack for $29.99 by clicking here. This long-requested feature for Studio One Artist is now available as a convenient and inexpensive Add-on! Add .MP3 import and export functionality to Studio One Artist for a low price. Once you’ve installed this, clear up a little disk space by uninstalling Audacity—you won’t be needing it to get your .MP3s converted to .WAVs for use in Studio One Artist anymore. You can purchase and download the MP3 Encoder $9.99 by clicking here. 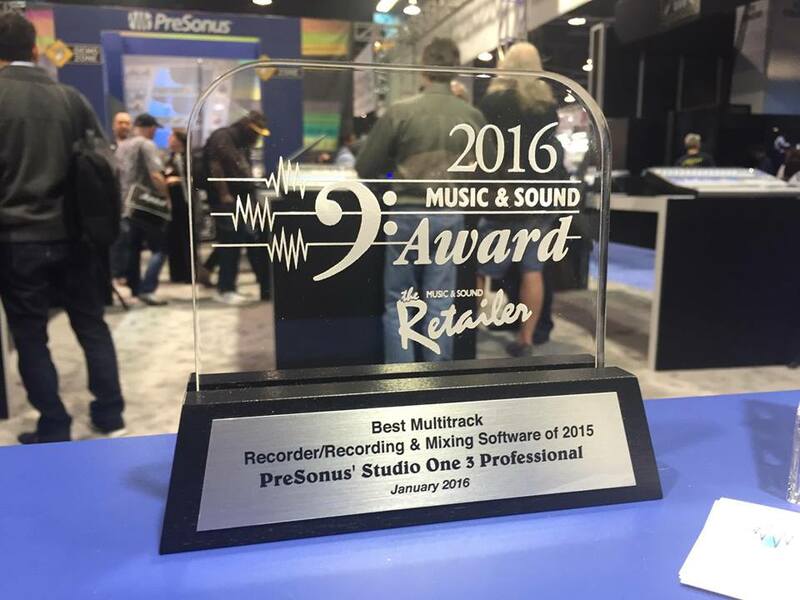 Mark your calendar: PreSonus is Broadcasting LIVE from NAMM 2014 Jan 23-25! If you’re reading this, it’s already relevant to your interests. Why? Because if you’re the sort of person who spends free time poking around on the blog of an audio equipment manufacturer, then you’re someone who loves gear. So, as much as we would love to have purchased all of you die-hard members of #TeamPreSonus badges to the show, the fact of the matter is you wouldn’t all fit in the convention center. We’ve done the next best thing. At the time of this writing, Justin and Rick are packing wooden crates full of cameras, switching devices, routers, (wired and wireless) microphones, and positive attitudes, and we are lugging an entire broadcast station to NAMM. Once there, we will broadcast LIVE from the show floor on Jan 23-25. Tune in at www.presonus.com/videos/presonuslive. 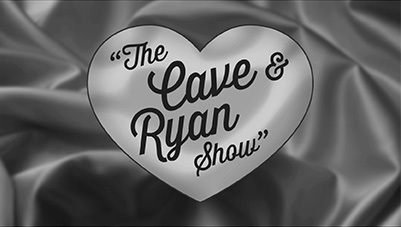 The broadcast will be repeated each day for those of you on the dark side of our planet during the live segments, and will include our booth presentations, interviews, The Cave and Ryan Show, and probably a bunch of surprises. Sure, you could check in periodically at manufacturer Facebook pages to get boring, blurry pictures of new gear, but why settle for that when you can see the glorious sway of Cave’s wavy locks in 720p? In our continued efforts to play well with others, we will be bringing you coverage of ANY and ALL cool new NAMM stuff that strikes our fancy, and hopefully yours. We know that you are interested in stuff from brands other than PreSonus, (so are we) and nobody likes the guy at the party who only talks about himself, right? So, mark your calendars for Jan 23-25, while I start charging camera batteries and clearing off memory cards. I won’t see you in Anaheim, but you will certainly see us from Anaheim. Thanks to Harmony Central for this! This footage is from our new product launch party from NAMM 2013.